Registration R160 annually in September. We believe each child is an individual and that they learn at different rates, according to their development and personality. We have a fun-filled approach to the lessons with lots of repetition to give the child confidence and at the same time develop the correct style. 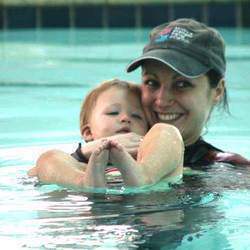 A parent/child approach, children can feel comfortable in the water, while learning basic safety skills and developing their swimming ability. One teacher one child lessons, cater for children on all levels from beginner to advanced. Each lesson is adapted for the individual child. Children learn all 4 strokes, diving, tumble turns, starts and finishes. Development of strokes. Instructions take place outside the water equipping the children for galas, while fitness is maintained and stroke correction is improved.